Every season has its fans. There are those who live for the return of spring every year when soft color creeps back into the world with newborn freshness. There are others who love summer when the sun turns up the heat and shines gloriously on the deep, rich greens of trees and grass. And there are those who cherish every moment of winter’s stillness when the earth sleeps under a blanket of snow and frosty ice crystals cover the windows. But for some of us the best season of all is autumn. I wait all year long to see the scene just to the left of me right now. The sun has reached the perfect position to shine thru my window in the afternoon and just behind the bamboo blind I can see the golds and fiery reds on the branches outside swaying in the wind. I cherish this view all the more because it’s so fleeting. I know that it won’t be long before those trees are bare and brown and I’ll draw the curtains against the bleak grey skies. Nature’s first green is gold but so is her final burst of color and it’s equally precious. It’s no wonder that when I considered what sort of tutorial to do for this month’s newsletter my Muse picked up bits of autumn colors to work with. 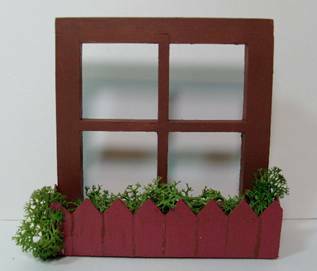 What really surprised me was a sudden burst of inspiration about how to make the cutest little picket fence window box! I have a couple of half scale houses on my worktable right now and as I scrambled thru the pieces to find the speed shingles I was so excited I almost dropped everything I picked up. Then I found them at the back of the table………half scale diamond shaped speed shingles! C’mon and I’ll show you how it turned out! 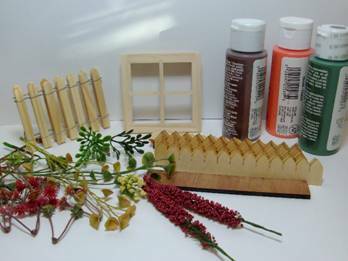 This is what you’ll need to create the sweetest 1:12 scale window box you ever did see. 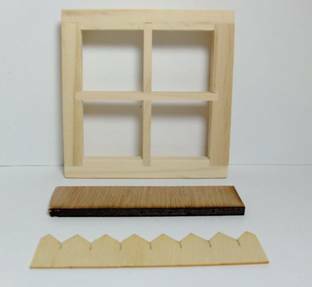 For the sake of instruction I’m using a new window but you can easily make these window boxes for windows that are already installed in your dollhouse. 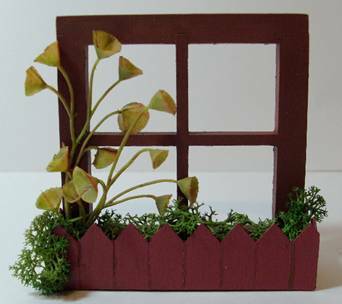 I’ll probably use this window and picket fence for a vignette so you can see how versatile this technique can be. 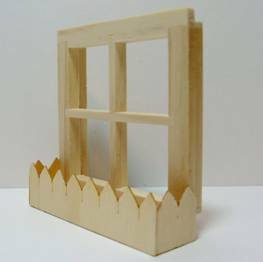 And because the window box attaches to the window frame, you can make these ahead of time and install them in your dollhouse as one whole window unit. Pretty cool huh! Begin by cutting a piece of ½” wide plywood the exact length of your window. The reason I didn’t list that piece of wood in the supplies is because it comes with the speed shingles! Laser cut speed shingles are packaged in bundles and each side of the bundle is protected by a strip of wood the same width as the shingles. If you’ve used speed shingles before, you know all about that wood and I’m willing to bet that you have several of them tucked away in your stash box for future use. In this case, we’re going to make good use of that wood strip by cutting it to fit the window. Take one strip of speed shingles and cut it the same length. 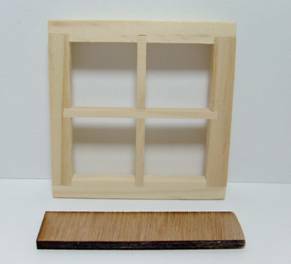 Use the strip of wood as a template and be sure to center it in the center of a diamond peak as much as possible on both sides so your window box will look centered. 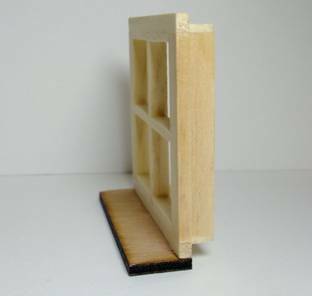 Glue the wood strip to the bottom of the window frame, making sure that it is flush with the back edge of the frame so it will lay nice and flat against the side of your house. 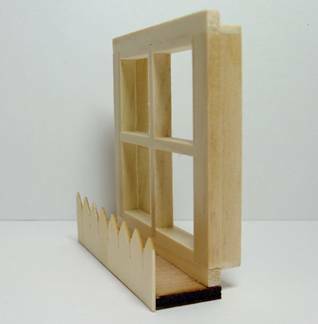 If you’re making the window box to fit a window already installed in your dollhouse, you can see how the wood strip will form the base of the window box—simply glue it to the bottom of the window frame and against the side of the house. The remainder of the instructions will be the same for both uninstalled and preinstalled windows. Glue the strip of speed shingles you cut to the front of the wood strip. Cut two smaller pieces from a strip of speed shingles to fit the sides of the box. You want the back edges of the side pieces to be flush with the back edge of the window frame. 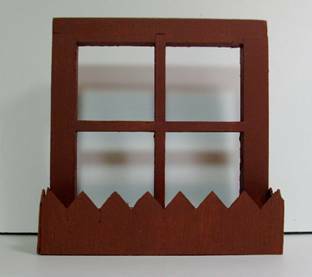 Glue the pieces to the bottom of the window box and to the side edge of the window frame. It’s looking cute already, isn’t it! You can see the picket fence taking shape nicely. Paint the window and window box. Since this is an autumn scene I’m using a warm, toasty brown. 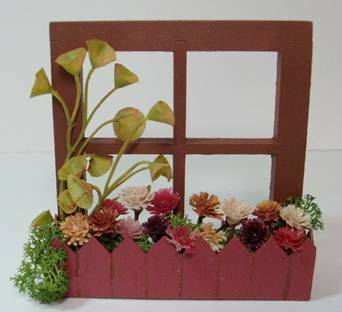 To add some warmth and depth to the paint, I added a coat of dark brick red to the window box. After the paint has dried but not hardened, use a sharp craft knife to *gently* score vertical lines into the window box from the exact center of each valley all the way to the bottom of the strip. Don’t press too hard since you want to score thru the red paint but not all the way to the bare wood. You’ll see the brown paint showing through which works well to define each picket. I prefer a rustic look for autumn so I used a small brush and the brown paint to add a random “shadow” to each scoring as well as dry brushing some brown over the red to give it a slightly weathered look. 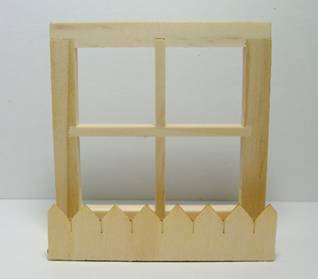 I’m going to pause for just a moment to comment on the fact that a picket fence window box would be simply gorgeous for a spring or summer look as well. I can just see this window box painted white and filled with pastel flowers! What a charming cottage look that would make! It would be perfect for shabby chic as well. But back to our autumn design! Smear a little tacky glue in the bottom of the window box and fill it with lichen or reindeer moss. I love using this as a filler for planters and window boxes because it helps hold the flowers in place while giving it a full and realistic look. Drape a bit of the lichen over the sides of the window box since greenery has a tendency to overgrow its container. A dab of glue will help hold it in place on the exterior of the box. Now comes the fun part of filling the box. We all know how expensive mini flowers and foliage can be, but every flower and bit of greenery that I’m using in this tutorial came from a national hobby store. The trick to finding those inexpensive mini blossoms and leaves is to take a small piece of posterboard and cut out a one inch square in the center. Tuck the posterboard into your pocket or purse and take it with you to the hobby/craft store, then wander thru the huge floral department and hold the posterboard over the flowers and leaves, framing them in the one inch cutout. That little trick is a fool proof way of ensuring that your floral findings are perfectly in proportion and scale. Your best chances of finding 1:12 scale treasures is to focus your attention on the filler plants and flowers although you can occasionally find tiny blossoms acting as a ‘spray’ in larger arrangements. These are some of the filler flowers that I found at that national hobby store and they come in all colors. 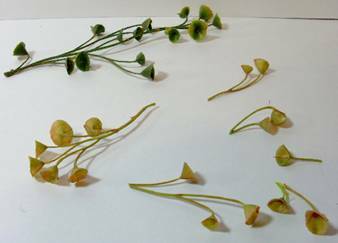 There are mini leaves to be found in the vine section that are easily cut into smaller pieces. 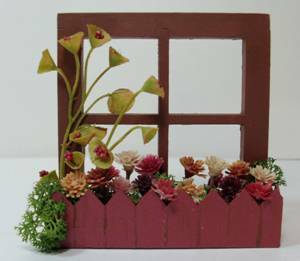 Cut several pieces of greenery and glue them to one side of the window box in layers to create a vine effect climbing up the side of the window. Then glue your flowers into the lichen. You can use more flowers for an overflowing look or fewer flowers to let the green lichen peek through. We’ve all seen these little bunches of tiny foam beads in floral arrangements. 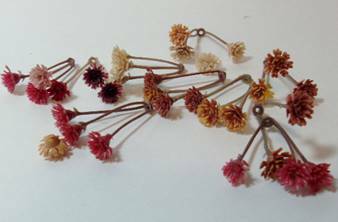 But did you know that if you use tiny scissors such as embroidery or manicure scissors you can cut them off close to the center and have little flower buds on tiny stems? 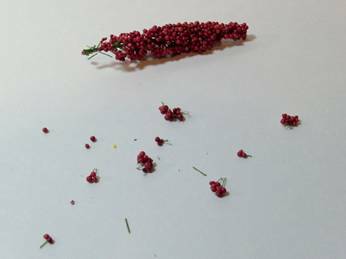 These are perfect to set inside curved leaves or to tuck into lichen as small buds. 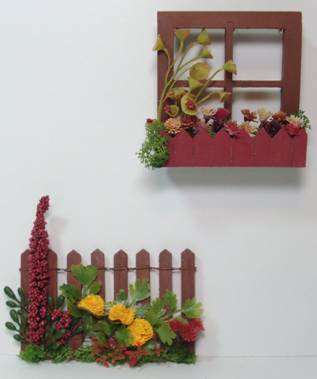 They add the perfect finishing touch to a pretty little picket fence window box! I really like this technique because it’s such an affordable way of making and filling a window box. 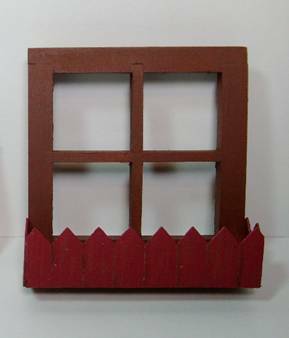 The half scale speed shingles are very affordable at $8.95 for a whole bundle which means you can make window boxes for every window in your dollhouse and half the neighborhood! Best of all, you can get entirely different looks by using the other shapes of speed shingles—fishscale, hex, and octagon. Who would have thought that half scale shingles could make such delightful 1:12 scale window treatments. I need to explore some other options for these little darlings! I had so much fun with this autumn window box that I couldn’t stop! Read on to the next article in this issue of the Gazette to find out how to make a coordinating fence to brighten up your landscape!